Whether you are pounding or pulling nails, hammers are needed in every toolbox. Hammers serve many more uses than just pounding nails and just like any other tool, buying the right hammer can make your life easier and help your project turn out better. So which hammer type should you use? In order to choose the right hammer, we need to better understand the various types of hammers and their uses. There is a large variety of handle materials available and the price varies greatly too. There’s a difference between a regular hammer and a framing hammer for example. Once you have narrowed it down to the type of hammer you need, next pick them up and hold them in your hand, if they feel balanced, comfortable and are inside your budget, then it is likely a safe purchase. The hammer is one of the oldest tools known to man, so it is pretty hard to find one that doesn’t work! Which Hammer Type Should I Buy? The Tack Hammer is a lightweight hammer that has a magnetized face on one side to help in starting tacks and small nails without having to hold on to them. This type of hammer is traditionally used for attaching upholstery fabric to furniture frames. A Finish Hammer is normally lightweight and designed with a smooth face to minimize marring the surface of the workpiece. Designed to drive only small finish nails and tacks in to trim and small wood projects, these hammer heads usually weigh between 10 to 14 ounces. Nail Hammers are your most common type of hammer because of its universal size. These types of hammers look like a finish hammer but are a little larger with the heads weighing between 14 to 20 ounces and with faces that are normally smooth. These hammers are useful for driving and pulling nails or prying up wood. Framing Hammers are designed with a heavy head and a long handle to maximize the nail driving power. The face of the hammer is usually textured or waffled to give a more positive contact between the nail head and the hammer’s face. The heads of these hammers weight anywhere from 18 to 28 ounces. A great example is the Powerstrike framing hammer. You can even get a Stiletto titanium hammer for a lighter weight tool that hits just as hard. 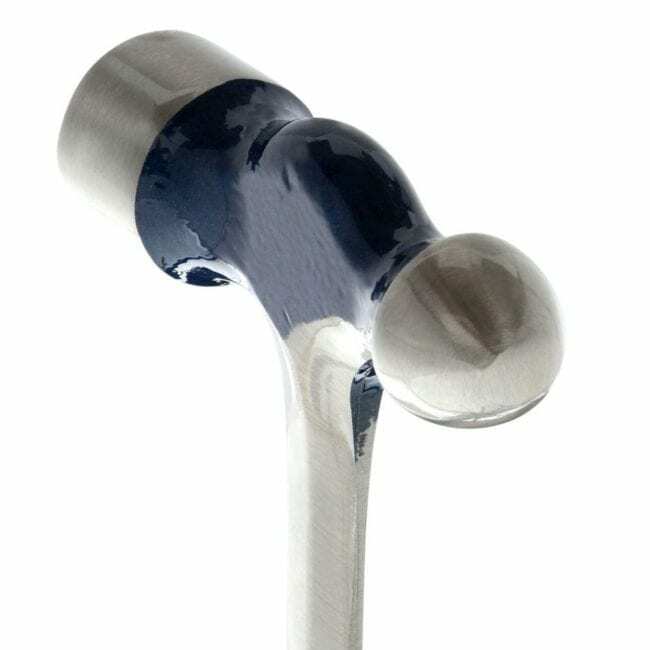 A titanium hammer may even be healthier for you. Ball Pein Hammers usually are for heavy-duty jobs that are inappropriate for standard nail hammers or for jobs that a mechanic might have when driving out pins or setting rivets. These types of hammers feature a rounded ball on one end which is good for shaping and a flat peen on the other end for pounding. The head weight on these hammers can vary from as little as 6 ounces to over 30 ounces depending on the use. Mallets or Soft-face hammers feature plastic, rubber, soft metal or wood pounding faces that can be used for driving chisels or applying force to delicate surfaces. The appearance of these hammers can vary greatly depending on the manufacture and the final use. A Dead Blow Hammer is a special type of mallet that is useful in minimizing damage to the struck surface and in controlling striking force with little bounce back from the striking surface. The head of these hammers are usually hollow and filled with sand or heavy metal shot which helps to absorb the impact of a blow and reduces the bounce-back. Sledgehammers are heavy-duty, two-handed hammers used mostly for demolition and driving stakes. They usually consist of a large, heavy metal head that is attached to a long handle. The sledgehammer can apply more strike force than other hammers due to its large size. So this one won’t actually help you get any physical work done. However, if you long for the 80’s and 90’s, it might just make the hours pass by more quickly. The hammer type you use will be in part determined by the work that you will be doing. You won’t use a tack hammer to demolish a wall in just the same way, you can’t use a sledgehammer to pound in a finish nail. Keep in mind when choosing a hammer to make sure it fits your hands and that it feels balanced. Editor’s Note: This article originally published on January 19, 2009. That was an excellent article. Informative and entertaining! I was so into it..and then the end had me spitting coffee out my nose!